No one's going to drop $25,000 on a fabulous 84-inch 4K TV without something to watch on it. 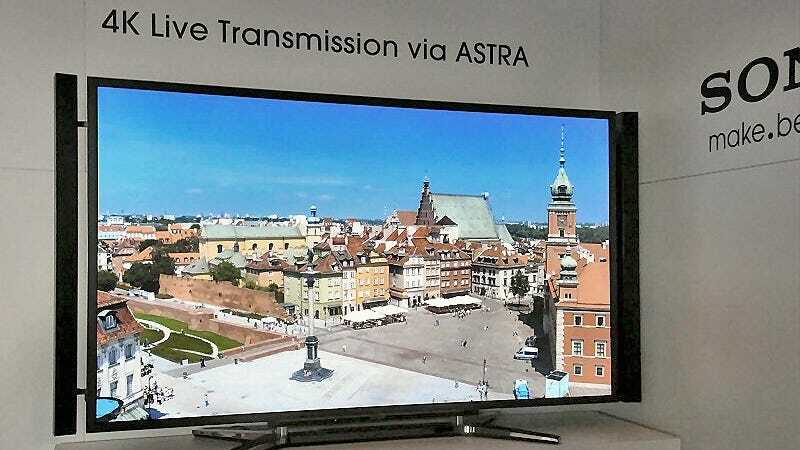 So to get the broadcast ball rolling, Sony has demonstrated a real-time satellite transmission system that cleverly compresses a 4K signal without reducing its stunning image quality. Working with a Luxembourg-based satellite distribution firm, Sony demonstrated the new system at the IBC trade show that's just wrapping up in Amsterdam. Using existing H.264 compression technology, the massive 4K signal was smooshed to a 50Mbps stream, which is the equivalent of a broadcast-friendly 1920x1080 high-def signal. That means, theoretically, that existing broadcast and streaming hardware can be used to transmit a 4K signal. This could speed up the 4k rollout, since networks and stations don't necessarily have to upgrade all their gear. But Sony doesn't plan to stop there. In the future it hopes to employ a new video compression technology called HEVC—or High Efficiency Video Coding—to further reduce the signal to a mere 20Mbps, allowing them to transmit multiple 4K signals at once. The more the merrier.